Summer is upon us, folks! Summer in our house is… well, not really spent in the house. We are outside as much as possible and have already gone on several hikes and camping trips. This is the first installment in a series of informative posts to help you and your families enjoy the great outdoors safely and stress-free. Hiking is a great way to get your family outside and enjoying nature (and each other’s company). There isn’t a lot of special equipment involved, and a hike can really be tailored to suit your family’s needs. If you are a novice hiker, plan a short half-mile or mile hike. A shorter hike means you don’t need to carry much with you, and can also help everyone get accustomed to the outdoors. In no time, you’ll be looking for longer hikes and feeling more and more confident in your outdoor abilities. Something about the fresh air, the lack of distractions, and the exercise just makes hiking a perfect family activity. By taking our kids hiking we are modeling the importance of a healthy body to them. We are telling them that we would rather be in the middle of nowhere with them than at home working on our to-do lists. Kids love hikes, and the memories made on hikes can last a lifetime. Sol and I on a recent Rocky Mountain hike. Something so simple can bring siblings closer together, and give parents a much-needed break from the day-to-day. Hiking is very conducive to conversation. Whether you are hiking with a baby and enjoying the time to connect with your partner, or hiking with kids and enjoying the extra opportunity to focus on them, a good hike will foster love and communication. Really take the time on your hike to try to see the world through your child’s eyes. At least in the beginning, hike popular trails. There are definite perks to hiking more solitary places, but until you and your family are comfortable hiking, popular trails are the way to go. Trails that see a lot of traffic are generally nicer. The paths are wider and very easy to follow. If you run into a situation that you are not prepared for you can just stop and wait for another hiker to catch up with you. Popular trails often have dedicated parking, and some even have restrooms nearby. Take a cell phone. We hike all over the Rocky Mountains in Colorado and have been in very few situations where we did not have cell phone service or could not find service by hiking a little further or backtracking. Just having a phone will give you some peace of mind and let you enjoy your outing. Hydration is key. Take a little more water than you think you’ll need. Depending on the difficulty of the terrain, the temperature, and the exposure to sunlight adults need to drink around a liter of water an hour or more. Don’t wait until you’re thirsty to drink. Layers. Unless you are hiking at low elevation and have a lot of faith in the forecast, dress in layers. We’ve been on hikes where we start out in 80-degree sunny weather and then a mountain storm kicks up and we get higher up in elevation and end up hiking in 40-degree rain. You can always take clothes off, but you can’t always add clothes. Whether your kids are walking the whole way or you’re bringing a stroller, go at your child’s pace. If you have to turn around a mile in, don’t worry about it. The point is to enjoy being outside and being together. Be flexible. Make the only definite goal coming home happy and healthy. Sunscreen: wear it. Make your kids wear it. Reapply halfway. You won’t regret putting on sunscreen, but you may regret not wearing it. Hats and sunglasses are also a good idea. Snacks: Make sure you pack high protein, high carb snacks for your little ones, and take a break before they start complaining of hunger. Hiking is hard work! Notice nature: This is a great opportunity for your kids to explore nature. See how many kinds of flowers you can find. Stop to examine any tracks you see. Encourage rock collecting. Answer their questions. Throw some toilet paper in your backpack along with a plastic bag to keep used toilet paper in. Trust me. Have a destination. Kids love to hike TO something. So find a good hike to a waterfall, or a cool cave, or a lake. 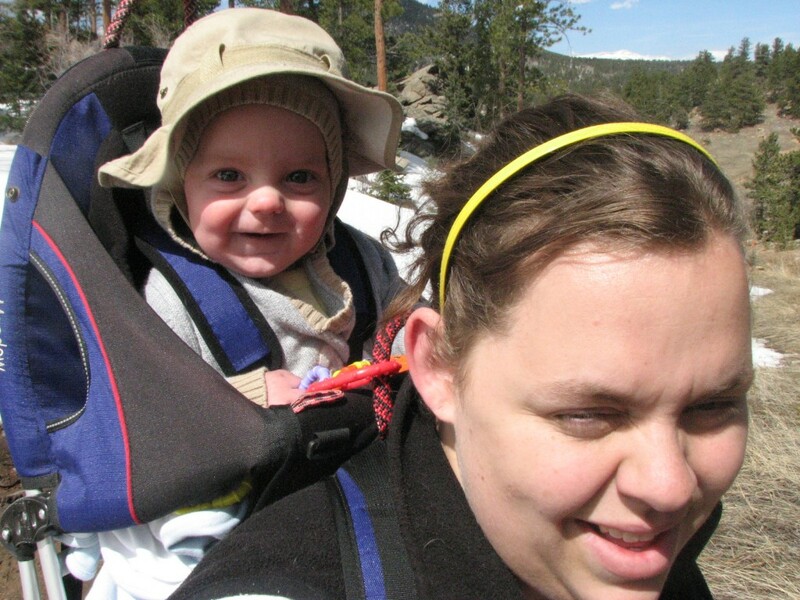 Babies’ needs on a hike are very similar to kids, except that they can’t talk to you. Stop often to check on baby. Check to see if he’s hot or cold and adjust his clothing as necessary. Breastfeed him or offer him a drink more often than you would at home. Find a comfortable carrier. While an older infant might walk around and explore a bit, you are going to carry her most of the way. There are many hikes with wide paved trails where you can just bring along the stroller, but for more remote hikes we have found a backpack-type carrier to be indispensable! Get out there and try a hike with the best hiking boots from Live Your Aloha. Just commit a Saturday morning, do a little research, and go! Happy trails! Great tips! I’ll have to figure out if there’s a good place to hike near me! are both great resources to find hikes near you!